Sometimes basement problems run deeper than waterproofing. That’s why Baker’s Waterproofing has developed the expertise to repair foundation walls that have bowed, tilted, or cracked. It makes little sense to waterproof a basement with walls that are in danger of buckling or that allow water to pour in through cracks! Our technicians have an array of products at their disposal to fix nearly any foundation problem. 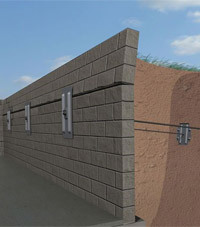 The GeoLock® Wall Anchor System offers a permanent solution and may not involve excavation outside your home. 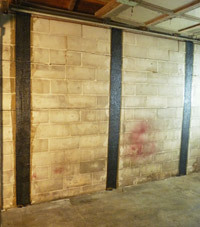 When wall anchors are not feasible due to space limitations, Baker’s Waterproofing may resort to one of three systems to stabilize and repair walls from inside the basement – no excavation necessary. They include the Carbon Armor™, PowerBrace™, and WallDefense™ wall repair systems. Our warrantied wall repair system can solve your foundation issues! Call us for a wall repair system quote today! We serve Washington, Bethel Park, Greensburg and many nearby areas in Western PA, Northern West Virginia, and Eastern Ohio. For severely bowed or tilted walls, wall anchors may be the answer. 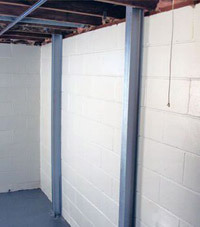 Steel rods, anchored in stable soil well beyond your foundation walls, are secured to your wall with steel plates. The rods are threaded at the wall so that the plates can gradually be tightened against the wall. In many cases the wall can be straightened to its original vertical position. Best opportunity to straighten wall to its original position. Straightening can be done gradually or immediately. Less disruptive and expensive than replacing the wall. The system may be used to repair garage foundation walls damaged by street creep. CarbonArmor® reinforces block or poured concrete walls that have cracked and bowed with stronger-than-steel vertical straps to ensure stability over the long term. Our technician will determine how many straps you’ll need, depending on the severity of your situation and the length of the wall. He will then embed them in a high strength epoxy resin. The straps will not stretch, so the wall cannot continue to bulge. The straps lay flush against your wall. In more severe situations, Baker’s Waterproofing can resort to a system that uses I-beams to reinforce and, in some cases, straighten your wall. With the PowerBrace™ Wall Repair System, a bracket and a screw assembly are bolted to framing near the damaged wall. The I-beam is installed between the screw and the wall and is anchored at the floor. Then the screw is turned to force the beam against the wall. Over time, the pressure can force bowed or tilted wall sections back to their original position. Adjustable I-beams allow the wall to be straightened over time. Anti-corrosion zinc coating keeps components free from rust.